Lily is sick, so this is her sick day, not mine. She is sitting on the couch, sneezing and sniffling and coughing, poor thing. 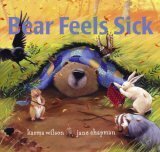 I think she’ll stay home from preschool today, and we’ll do things like snuggle and read Bear Feels Sick by Karma Wilson and drink lots of juice. And maybe watch a movie. Emmy, who feels perfectly well, is already pestering her sister unmercifully, so I can see it will also be a day of refereeing. ← Hello, Random Tuesday Thoughts, How Ya Been? Aw. Hope she feels better soon. Feel better soon Lily.Bridget and Aisling's mommy.